CoreOS, maker of the container-oriented Linux distribution of the same name, is now offering a commercial version of its product that's built for enterprises and includes tools for managing containers at scale. The new product, called Tectonic, combines CoreOS with Kubernetes, the container-management tool created by Google. CoreOS says Tectonic "delivers Google's infrastructure to everyone else," but it might be better to say it delivers CoreOS's idea of Google's infrastructure to everyone -- albeit as a single, complete stack, and not a some-assembly-required production. Alex Polvi, CEO of CoreOS, described Tectonic as "the opinionated complete picture" in a phone interview -- "opinionated" in the sense of embodying a specific philosophy of how to do distributed container deployments. All of the different pieces of the CoreOS stack -- its Linux distribution, its distributed data store, its networking technology, its container systems, and so on -- are finally packaged as a turnkey deliverable for enterprises. "This is really the full package coming together for the first time," Polvi said. 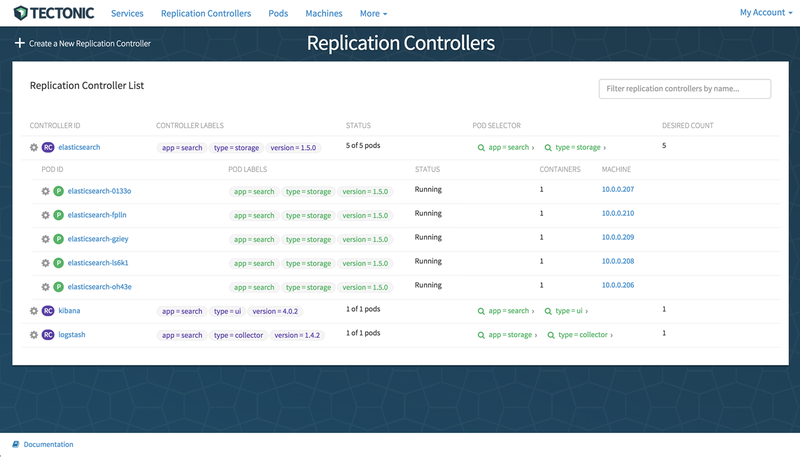 The replication controller dashboard for Tectonic, the turnkey enterprise version of the CoreOS software stack. Tectonic's main advantage is in leveraging Kubernetes for container orchestration for enterprise application workloads. 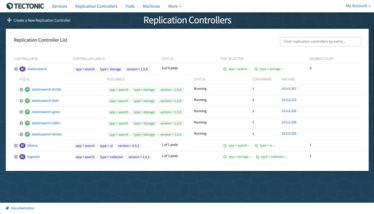 Aside from the software stack, Tectonic provides an installer and updater, management console, tools to interact with the API set, and "a curated set of all the open source projects that are supported," as Polvi put it. Today's release is an open beta with select customers rather than a full general-availability release, so no pricing has been announced yet. CoreOS's intention is to stir up further interest, then announce a full-blown release in the second half of the year. 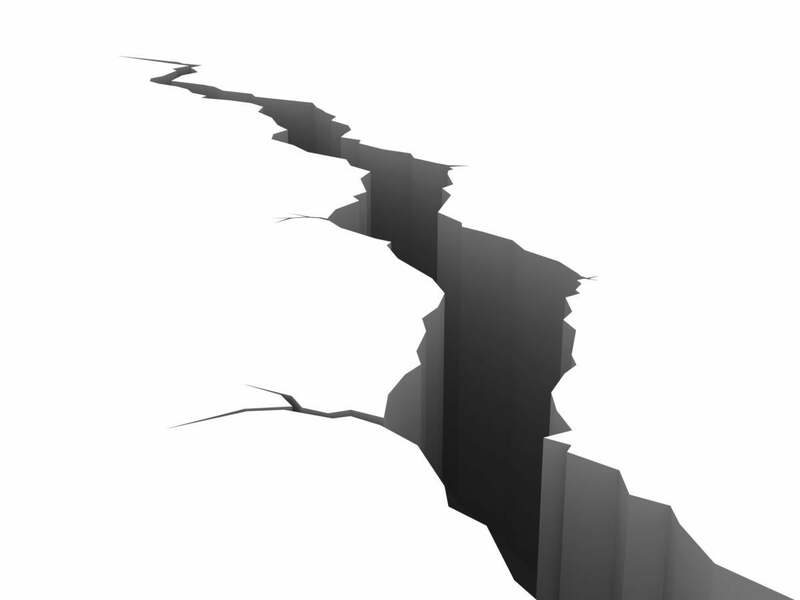 Those currently running an existing CoreOS stack shouldn't have trouble migrating to Tectonic, said Polvi. "We can help you do it," he said, "but if you're already on the CoreOS stack, a lot of the tools will be familiar to you." The main difference between Tectonic and the do-it-yourself CoreOS stack that companies might already have in use, Polvi said, is Kubernetes itself. Polvi believes most of CoreOS's users want to understand what's under the hood, but can also benefit from having some heavy lifting taken off their hands. "This is kind of a new way of doing infrastructure," he said, "and you don't want a complete black box, you want to know what's going on. But at the same time, even once you understand all the pieces, it can be difficult and take some time to get a distributed system up and working correctly. Our bet is that they're fine with having us curate and take care of it for them once they understand how the stack works." One question that comes to mind is the limited choices CoreOS made with Tectonic -- including Kubernetes as the default orchestration tool. Brandon Philips, CTO of CoreOS, said it was possible to use another orchestration layer, but "Tectonic is built on Kubernetes because we believe it is the best way to do container orchestration," and "with Tectonic we are building an opinionated product to help customers get running quickly; and we are curating which components to use for our users." This is not the first time a container-oriented outfit has put Kubernetes to work for enterprises; Google has done it with Container Engine, and Microsoft equipped Azure with similar functionality. Red Hat, too, has spun in Kubernetes via its container-oriented Atomic Host project. What sets CoreOS apart is its minimal design -- which Red Hat strived for, but without CoreOS's clean-slate approach -- and the fact that it can be run on private infrastructure, rather than requiring a commitment to a cloud vendor. The Google connection for CoreOS doesn't stop with Kubernetes. The company is also announcing a new $12 million investment round, with Google Ventures as one of the main backers. Evidently Google doesn't see a contradiction in sponsoring a company hard at work on software that competes, however indirectly, with its own cloud-architecture business. That, or Google imagines the benefits reaped by the open source work CoreOS will provide for Kubernetes (and containers generally) will more than outweigh any potential loss of customers. Serdar Yegulalp is a senior writer at InfoWorld, focused on machine learning, containerization, devops, the Python ecosystem, and periodic reviews.